When I started out building the garage edition of the Bear Creek & South Jackson Railroad I had it in mind to scratch build all the turnouts. One reason was to save some bucks - with 100+ turnouts the cost would add up. Another reason was so I could get the turnouts I'd need - no trackplan compromises due to a restricted set of ready made track components. Nearly all the turnouts (outside of the staging areas) would be hand operated using ground throws. But something was bugging me. The hand throws that were commercially available (Caboose Hobbies) had a few problems. I'd seen some operating scale switch stands (called Hand-Stands) on the Railway Engineering website. They didn't look too hard to build so I figured I try building some operating scale switch stands of my own. The goal would be to have a moving target. To throw 'em you grab the target and twist. Since I'm already spending a lot of time making the turnouts themselves the extra time doesn't seem out of line. My big concern is reliability and longevity. How will they stand up to the wear and tear of regular use in op sessions and will they be able to take an occasional errant elbow? Since these were going to get grabbed and twisted by full size operators I was concerned about strength. Styrene wasn't an option. I figured I'd try making 'em out of brass. Here are some pictures of the results. They are made of brass stock (L-channel, tube, and strip), piano wire, and some springs I bought at a surplus store. With the right jigs I can make and install one in about 45 minutes. Click on the pix for enlarged versions. I never did figure out how to paint and weather 'em! The targets need to be soldered on after they are installed to ensure correct alignment and the soldering flux makes quite a mess (you can see a glob of flux at the top of the stand's frame work). The joint between the lever arm and the vertical shaft was too weak. Even when soldered with silver-bearing solder a little over-zealous operator could twist the joint apart. Sometimes just the spring tension was enough to twist this joint apart. 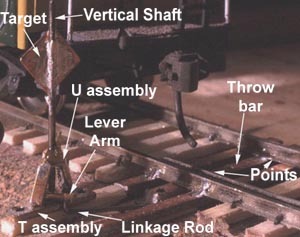 When a train is parked on a track in front of the track where a turnout needing to be thrown is located the operators could not 1) see how the turnout was aligned because they couldn't see the switch stand target (or points), and 2) they couldn't see the switch stand to twist the target. If there is a train next to the switch stands it's hard to reach in a twist the target without having fat (full scale) fingers bumping the adjacent train. This problem I solved by drilling a hole in the non-operating end of my uncompling picks. Operators could now set their picks over the switch stand target and throw it. They really are still too big for HO - probably be good for S or O. They sure are a pain to assemble and install. I advise caution for anyone incline to build these things. If the vertical shaft were braised to the lever arm this should end the joint failure problem. How do I build one of these buggers? If after reading the above disclaimer you still wanna try building some switch stands here are some instructions. 1. Take a piece of brass L channel (3/32" x 3/32") and lay it "V" down in a groove. 2. Use a triangle cross section jewlers file to make to cross ways grooves in it going nearly all the way through. Make the two cross grooves about 1/10" apart. 3. Bend the L channel at the new cross grooves to form a sort of U shape. 4. Solder the joints (use silver solder). 5. Drill a .035" hole in the bottom of the U for the vertical shaft to pass through. Now cut off the ends so it will stand upright like an upside down V with a flat bottom. Make the top of the upside down V (or U) about 1/4 to 5/16" high. This is a matter of appearance. 6. Take a piece of brass bar stock about 1/32" x 3/32" x 3/4" and drill a hole about .050" in the middle. 7. Cut a length of .047 brass tube about 1" long (should be slightly shorter than your roadbed thickness plus tie thickness. 8. Solder the tube into the hole of the brass bar from step 6. Make a T shape with about 1/32" of tube protruding above the brass bar. 9. Cut a piece of .031 piano wire about 2.5" to 3.5" long. 10. Drill two holes in a piece of brass bar about 1/32"x1/16". Make one of the holes .035" and the other .028". Make the two holes about 0.8 times the throw distance of your turnout. 11. Cut off the lever arm from step 10 just beyond each hole. 12. Solder the lever arm to vertical wire from step 9 about 1" from one end. 13. Thread the lever arm and shart assembly into the tube from step 7. Make sure the lever is at the top of the "T" assembly. 14. Thread the stand superstructure onto the vertical shaft and solder the legs to the top of the "T" assembly being careful not to solder the staft to the tube. When done you should have the lever arm on the shaft enclosed in the upside down U shape. Some of the brass bar (top of the T assembly) shold protrude beyond the legs of the upside down U. 15. Go to the turnout where you'll be installing the turnout and drill a .050" hole about 8 scale feet (1 1/16") from the track center line in one of the switch ties. This hole should be as perfectly vertical as you can manage to avoid having the switchstand "tilted" when installed. 16. Push the assembly from step 14 into the hole to test fit it. Look underneath. If any tube protrudes from the roadbed remove the assembler and using wire strippers carefully take off enough tube so the tube end is about 1/16" above the bottom of the roadbed. 17. Remove the assembly and drill .030 in the ends of the U/T assembly (from step 14 and 16) for mounting spikes. 18. Place the assembly back in the hole. Carefully cut and bend a piece of .025 piano wire so both ends bend up at right angles and the length between them is **exactly** the distance from the hole in with turnouts switch rod and the hole in the end of the lever arm attached to the vertical shaft. Make sure both the lever arm and the turnout points are positioned in the CENTER of their travel! 19. Attach one end of the linkage wire from step 18 to the turnout throw rod. Slide the switch stand up and then down so the lever arm hole accepts the other end of the linkage wire. 20. Cut a piece of brass or phosphor bronze sheet (.008") about 1/4" sqaure (or round or other shape) for the switch stand target. 21. Set the turnout to its "normal" route. 22. Solder the target to the vertical shaft so it is parallel to the track. 23. Twist the target 90 degrees with your fingers. The turnout should throw to the diverging route and the target should now be at 90 degrees to the normal route track. 24. Cut a piece of brass bar 1/32x3/32x1" for a spring lever. Drill a hole very near one end about .035". Bend it into an L shape about 5/16" to 3/8" from the hole. 25. Drill a second hole at the other end of the L shaped spring lever. About .030"
26. Go under the layout and slide the .035 hole onto the vertical shaft under the roadbed with the other L arm aiming down. Solder in place. The reason the tube of the T assembly was cut so its bottom is 1/16" away from protruding below the layout is so when the spring lever is soldered in place it won't solder the vertical shaft to the tube! 27. Throw the spring lever back and forth and note its range of travel. Mark the center of this range. Make a line (imaginary is fine) from the center of travel mark past the vertical shaft and drive a 5/8" #4 sheet metal screw into the roadbed. 28. Use a moto tool to cut off excess vertical shaft under the spring lever (L) arm. 29. 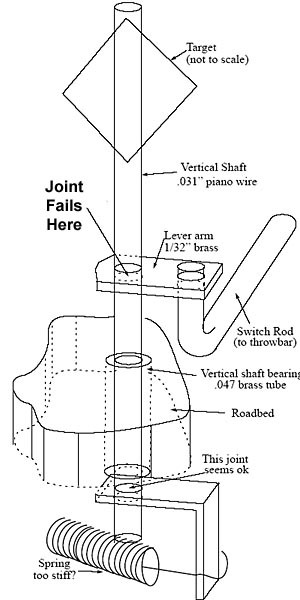 Stretch a spring from the bottom of the spring lever arm to the screw from step 27. 30. You're done. Twisting the target should now "snap" the turnout from one side to the other. If its really hard to twist move the screw closer to the vertical shaft. If it wants to always throw in one direction move the screw to the other direction under the roadbed. 3799 people have visited this page since Nov 17, 2000. This page and images copyright © 2000-2005 by Charlie Comstock.